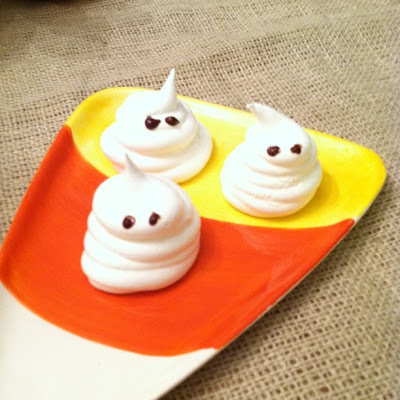 I made these Ghastly Meringues last night that I mentioned on the blog earlier this month. They turned out super cute and were VERY easy! Allow about 2.5 hours for the entire process (it only takes about a half hour to make, the rest is cooking and cooling time.) These would be GREAT cupcake toppers too. Hope everyone has a safe and a little bit spooky Halloween! so super cute! love them! those would be so cute on cupcakes -- good call! So glad they worked out for you! They’re adorable!